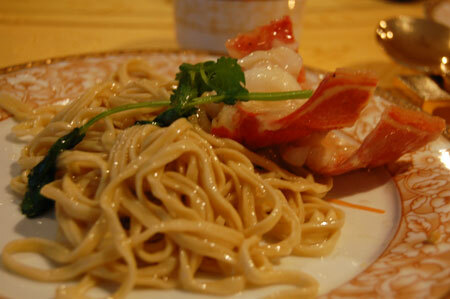 I like Fish Head Noodle Soup and I normally get it from Bateman Chinese Restaurant in Bateman. I like having a choice between Mi Hoon (clear soup noodle) and laksa. Today I had a chance going to Happy Union Restaurant for lunch (with mums at Japanese playgroup) so I tried the noodle. 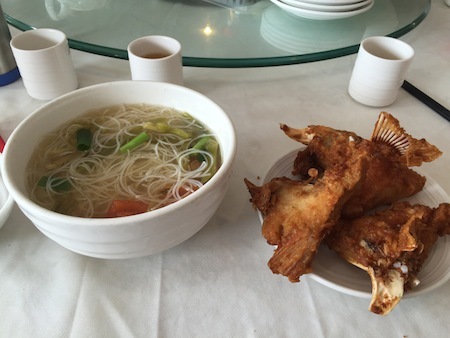 I had Fish Head Mi Hoon (clear soup) as I wanted to share with my son. It was $10.80 for lunch, and came with 3 pieces of deep-fried fish pieces. The soup tasted different to the one at Bateman Chinese Restaurant. 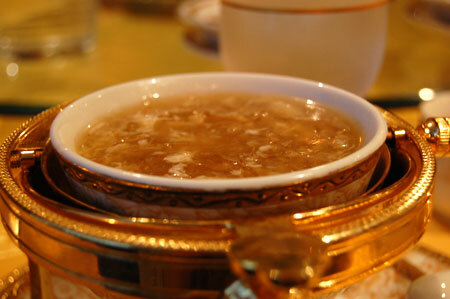 Clear soup with preserved vegetables and tomatoes – it’s same, but this one had a taste of ginger (which I liked!). The fish was very crispy, fresh, and I actually preferred them to the ones at Bateman. My son loved the fish too. Another thing I liked about is that this place is much bigger than Bateman Chinese so it was easy going inside with a baby pram. It was nice discovering another nice food 🙂 I will definitely come back here again for Fish Head and other dishes. 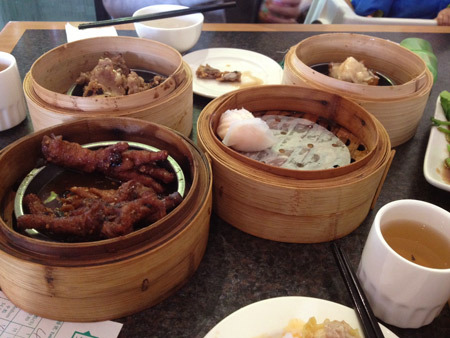 They also have Chinese Roast Meat (combination) but you’ll need to pre-book it 1 day before. 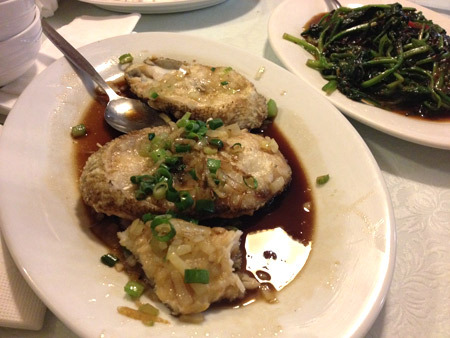 My in-law had been saying that shaumai at Lok’s Kitchen is nice, and I finally had a chance of going there for dim sum lunch. 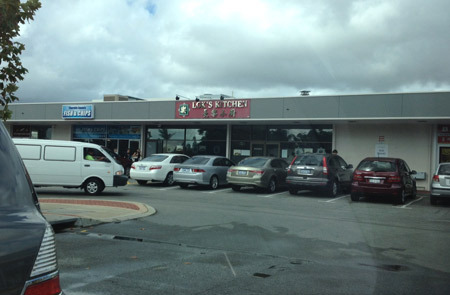 Lok’s Kichen is located in the complex of Thornlie Square Shopping Centre in Thornlie. It was Sunday and the place was pretty full when we got there. We got quite lots of food on our table – shaumai, steamed prawn dumplings, chicken feet, pork ribs, steamed tofu & prawn, fried squid tanticles, chili tofu, char siew pork buns, kailan with oyster sauce, and egg tartlets. The shaumai was really nice. It was tasty and juicy. 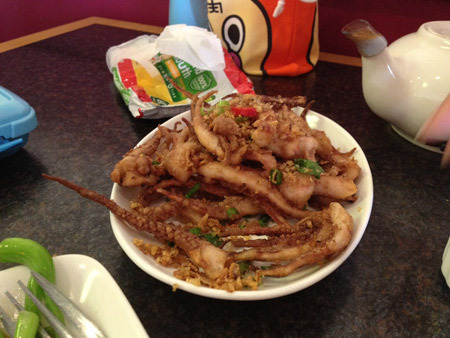 I also loved fried squid tanticles. It was nicer than the one at Northbridge Chinese restaurant on Roe street. Chicks. 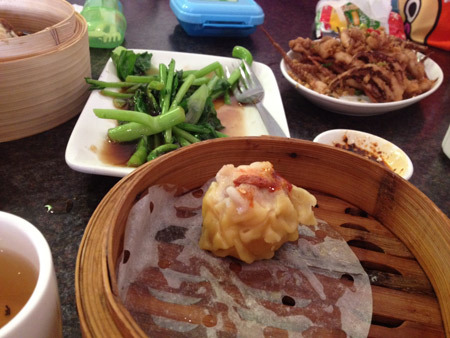 Feet and steamed prawn dumplings are nicer in Northbridge restaurants though, I thought. Chili tofu was nice too. I lives the crunchy skin. There was tofu and prawn inside. Although the name is chili tofu (I believe waitress said so) it wasn’t spicy at all. 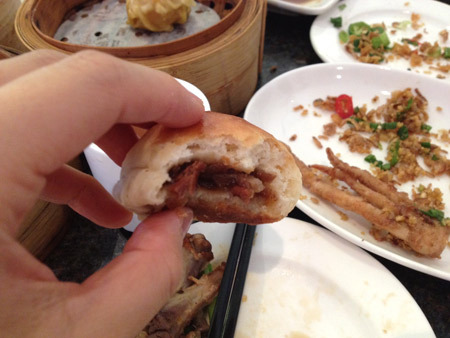 Char siew pork bun was another my favorite. I’m sure they handmade them. They are smaller than usuall size, but the bun was chewy and fresh. Custard tartlet was crispy outside and soft & fluffy inside. Yum! The staff was very friendly and I liked the place. Only one thing that I hesitate to go back there was that I saw a huge cockroach in the toilet…. It was a big turn-off 🙁 It was shame because the food was really good! 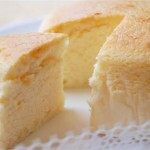 These cuisine use lots of oil in cooking, so I really miss Japanese food. Not those Japanese food that you find in Japanese restaurants here like karaage and tempura, but the real homy food like nimono and nitsuke. 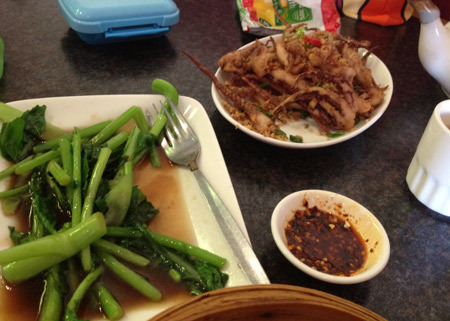 Anyway, my stomach was filled with Chinese/Singapore food tonight at Bamboo in Willetton. I wasn’t too hungry thanks to 1.5 hotdogs I had at IKEA afternoon, but my in-laws ordered 4 dishes for just 4 of us. Pan-fried tooth fish, sambal spinach, Thai-style chicken in lemongrass sauce, and 1/2 roasted duck. It was quite a lot of food as in-laws don’t usually eat much. I went outside to have a short stroll around Hi-Mart (Korean grocery shop) next door, and when I got back to the table two dishes had already been served. The tooth-fish was great. 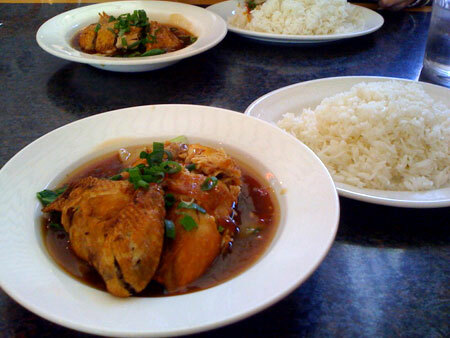 Crispy fish in buttery sauce did match with plain steamed rice. I found sambal spinach was bit oily, but I guess that’s what it’s supposed to be. Thai-style chicken was the one they ignite flame underneath the aluminum foil. Roast duck had the beautiful colored crispy skin. 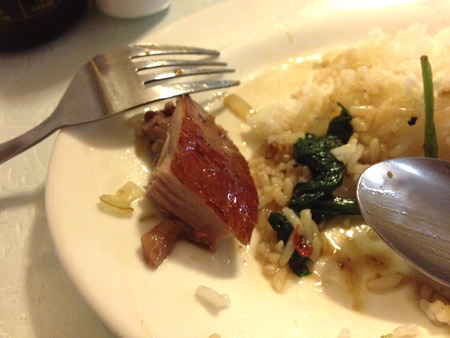 It’s just what people expect roast duck to be. 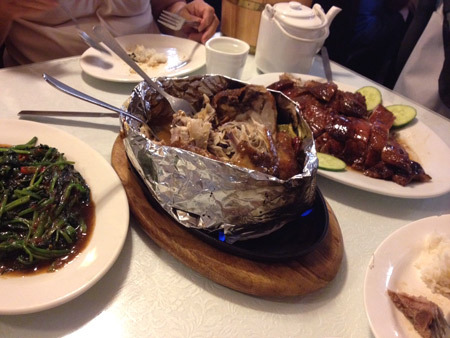 We couldn’t finish the food as I expected and ended up taking the roast duck home. Eating this type of food once in awhile is fine, but now I’m longing for a bowl of simple ochazuke for tomorrow breakfast. 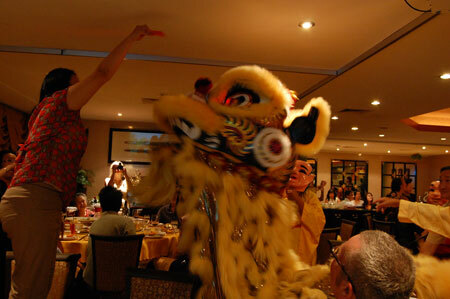 Han’s Cafe is a casual dining restaurant chain that you can find across Perth WA. 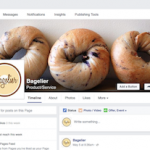 They serve Asian cuisine – mostly Malaysian, Singapore, and Vietnamese. Actually, Han’s Cafe was the place where I had my first date with D! It was Han’s Cafe Northbridge, and it was my first time to eat something Malay/Singapore/Vietnamese in Perth. I remember we both ordered broken rice with pork chop. (I just ordered what he ordered as I had no idea what the food were like on the menu) I could barely speak English at that time. 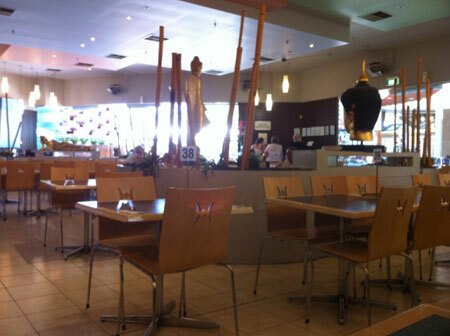 Despite the sweet memory, I have to say that not all the Han’s Cafe restaurants serve the same level of food… I really don’t like the one in Willetton – every single visit I made in the past, I regret that I spent money on the food there. Although Han’s Cafe is not really in my favorite restaurant list, I do go there sometimes when I feel like something Asian (non Japanese/Korean/Chinese). 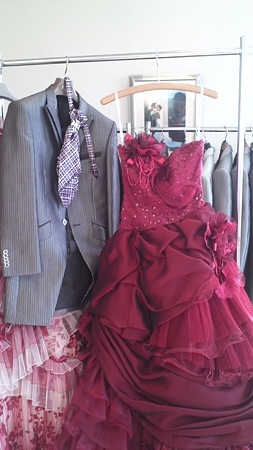 Among over 20 locations across Perth, my favorite one is the one in Carousel shopping centre. It’s just because of the atmosphere. 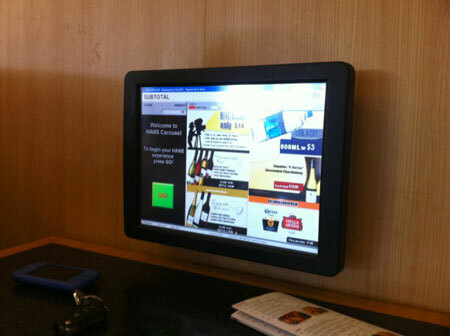 The place has many tables inside, and there are sofa seats with screen where you can place and check your order without leaving the seat. 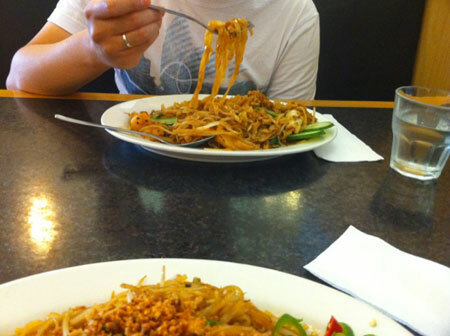 On my last visit, I had pad thai and D had char kway teow. The place wasn’t busy at that time, so the food came out really quickly. 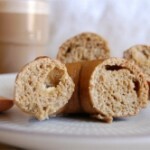 The foods there are not really special, but it fills me up when I want an easy, quick, reasonably-priced food. 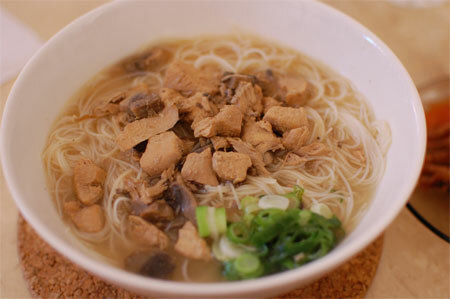 This is one of my favorite lunch – bihun sup ayam (rice noodle soup with chicken). Mother-in-law makes lunch on every Sundays and it has been this family’s tradition (?) for a long time -since my husband was a baby. Sometimes the food is chicken porridge, sometimes it’s egg noodle soup, but I like this bihun sup ayam the best. If someone asks me what noodle I like, I would say “bihun”. I don’t hate egg noodles, I just prefer rice noodle. I also like kway teow noodle. 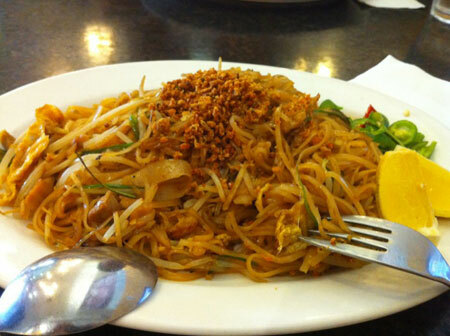 Some rice noodle is thick – like those you get at Vietnamese noodle house. I’m not really a big fun of the thick rice noodle as it’s easy to break (different to udon noodle which is supposed to be chewy). 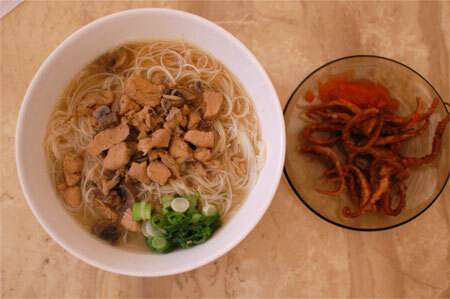 Rice vermicelli noodles doesn’t fill my big stomach enough, but I like eating it as snack. My friend recently had eyelash extension and she kept saying that she now loves looking at her face (eyes) in the mirror. She had the extension by a Japanese lady – friend gave me the information about the lady but I’m not sure if I ever get eyelash extension. 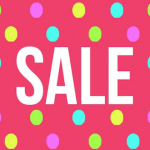 It sounds very interesting, but I’m not sure if it’s 100% safe, and it is also pricy and not permanent. But, after hearing from the friend I looked at my eyelash and realized that my eyelash has been falling off quite a lot! I believe I had more eyelash when I was younger (>0<). I never cared (I should…) about these things, and now I think I should do something about it. I’ve been wearing the serum on my eyelash for 2 weeks now, twice a day. 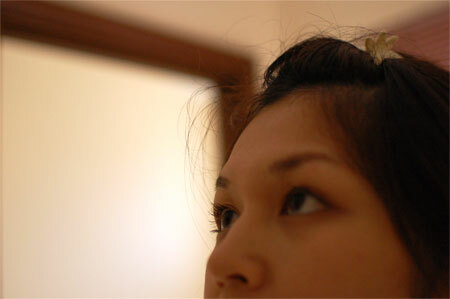 I haven’t worn mascara for the last two weeks, and I think that my eyelash has became stronger – less failing. These days my appetite has been strange. I feel hungry, but don’t know what I feel like eating. And, I get heartburn very often now. If I eat a lot in the morning, I can’t eat anything until late night. 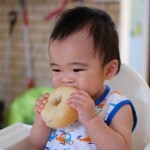 So, I just eat light food or snack little by little during the day. 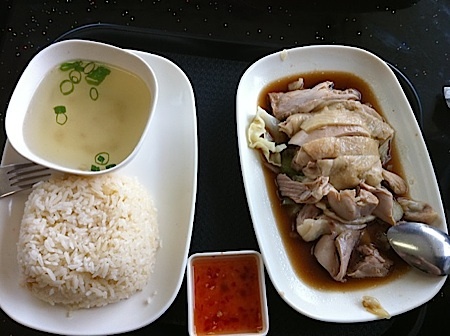 But, yesterday I really really wanted to eat chicken rice! I couldn’t do anything but thinking about it. It was around 3 PM, and D and I headed to Ten Ten. 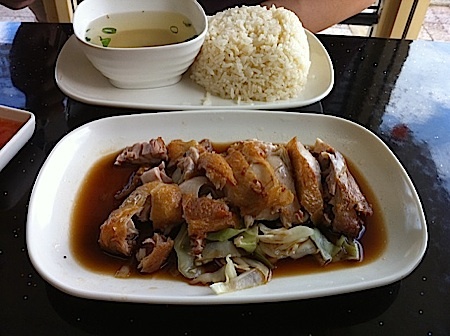 I ordered Hainanese chicken rice, and D ordered roasted chicken rice. We must have had looked like two starved little kids…. I ate it up all and so did he (^^). It was very satisfying afternoon! This morning I went to see my doctor. She called me up yesterday saying that she wanted to talk to me about my blood test. I was so worried if something was wrong! She said that Vitamin D level in my blood is quite low, and suggested I should take Vitamin D supplement. The average level of Vitamin D level is 50 – 120, but mine was 40. It’s not really a dangerous number, but if the number doesn’t change in future my body will have some problem, such as breakable bone. You get Vitamin D from the Sunlight (natural Sunlight generates Vitamin D in your skin) But, I don’t normally go outside in the Sun, especially in Perth, just to stay away from the UV and having skin problems. If I do, I’d wear sunscreen or some jacket to cover the skin. I actually haven’t been outside much since I started to work , around 15 years old. 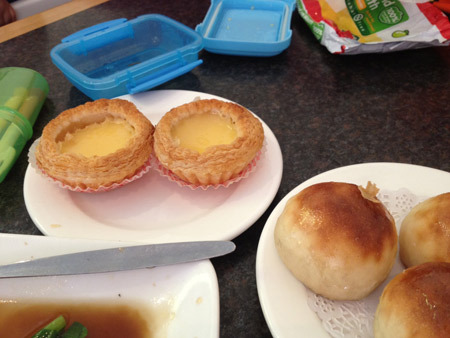 That could be the reason..
After seeing doctor, we went to Emperor’s Kitchen in Leeming Shopping Forum to have Dim Sum. 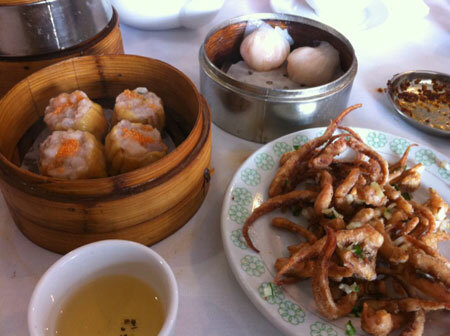 There are things I always and only get when I go to have Dim Sum. 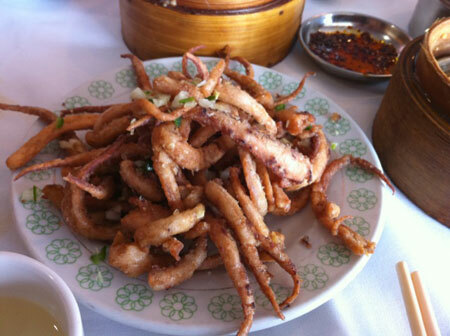 Fried squid, steamed prawn dumpling, chicken feet (if I’m with my husband), and ginger tripes (if I’m with my husband). But this time, we were starving (probably from the worry I had since the doctor called me), so we ordered A LOT. Perhaps we ate equal amount to what 4 or 5 people eat. 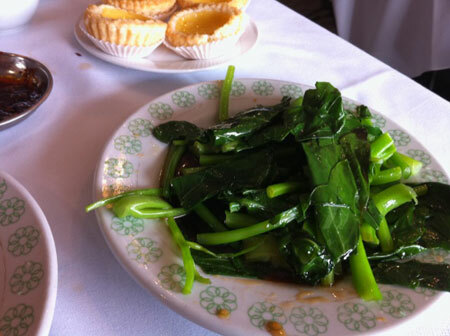 I ordered some vegetables too, just to help cleansing the oil in my body from those oily Dim Sum food. Can you see this? …. maybe not :p When we were at the house someone released tens of balloons to the sky! There are many balloons … but by the time I grabbed the camera they’re too far already. “Chicken Rice”… I didn’t know what chicken rice was at that time, as there is not such dish like Hainan chicken rice or roasted chicken rice in Japan. At first, I thought chicken rice was the stir-fried rice with chicken pieces in tomato sauce. That’s the chicken rice in Japan. It is really “chicken” and “rice”. But, it’s really yummy! The chicken skin is crispy, and the sauce is… addictive. I can eat it every day, but I’m sure this dish contains quite lots of sugar. 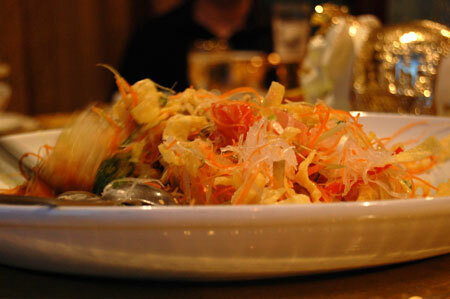 Vietnamese food are high in sugar and I can taste the sweetness in the sauce. But… very yummy! 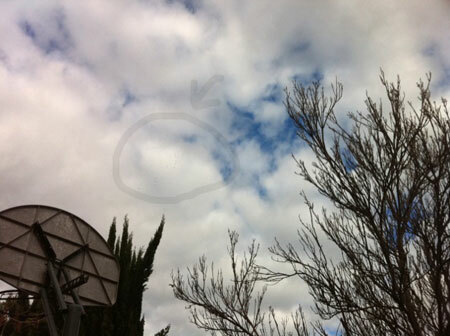 It has been cold weather in Perth, especially the mornings and the nights. I’ve went to Perth international airport just recently to drop off my friend who was going back to Jakarta. It was around midnight and the air was freezing cold. Inside the airport wasn’t that bad, but I still couldn’t take off my jacket. On the other hand, the friend seemed to be ok with it and took off his jacket and put it into his check-in luggage. If it was me, I would keep wearing it or at least keep in a cabin luggage in case it becomes cold in the plain. I sometimes have to ask for an extra blanket to a cabin attendant. It often takes some time for me to decide what to wear when getting on a plain. Mostly, the countries I’ve been flying from Perth is either Japan or Indonesia. The climate in Indonesia is always hot and humid. The seasons in Japan and Australia are totally opposite. So, whenever I fry, I always have to think about the climate and the season of the destination. If I fly to Japan in February, I have to bring a thick coat or jacket with me on the plain, otherwise I’d be freezing from the snowing weather. But I wouldn’t be able to wear even a long sleeve clothes to Perth airport as the temperature would be around 40 degree in February here. Anyway, he was flying to Jakarta, a place where you start sweating right after getting off the plain, so he was just wearing half sleeve shirt until the boarding time. The reason for him taking off his jacket could be also the sweet ginger dish that we ate at Joy Cafe in Northbridge before going to the airport. As he was flying with Jetstar, and it was his last night in Perth, we all had dinner together at this Chinese restaurant. We ordered a banquet for 4 which comes with today’s soup, choice of 4 main dishes, steamed rice and Chinese tea for four. It was $62.00, so we thought it’s a pretty good deal. It was only three of us when we got to the restaurant, but we were expecting three more people to join us. In the end, two canceled and one showed up with full stomach, so three of us had to finish up the four dishes. 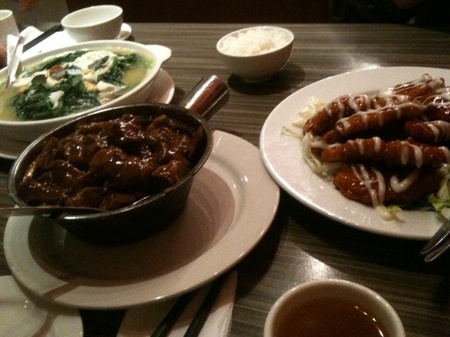 :p We ordered stewed beef brisket, honey king prawn, spinach with two kinds of egg, and Peking pork ribs with mayo. The food was good, but what surprised me was the speed of their service. It may be because of the time we arrived the restaurant (late night), but they served the soup and 4 main dishes within 5 minutes we ordered. All the ingredients were ready to be cooked, I guess. You can’t imagine how full we were! 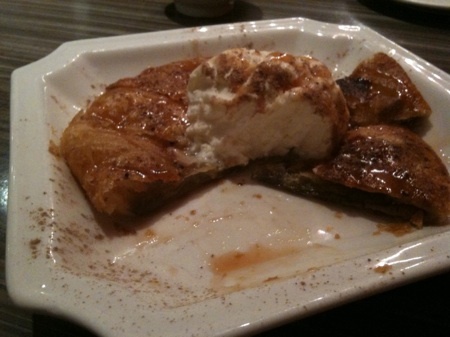 But, unbelievably, my husband and the friend ordered dessert (#0#). 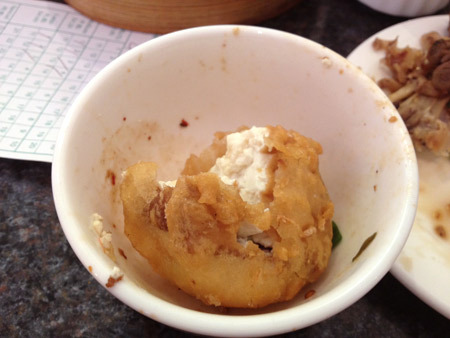 They ordered peanut balls in warm ginger syrup soup, and Chinese pancake with sweet red beans and vanilla ice cream…. and we also finished them up too. We had a course meal, which contains 13 dishes. The food was …. to me, not really special. Maybe it’s because those food are special New Year’s food, I don’t know. Well, I did enjoyed the atmosphere though. There was a big screen of tv showing a New Year’s event show, and we started the course meal by mixing up the Yu Sang together while yelling “Happy New Year”. 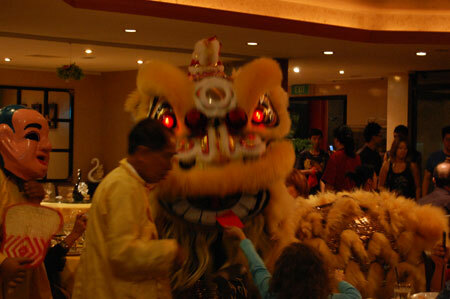 While we were about halfway through the course meal, it started … – dragon dance! 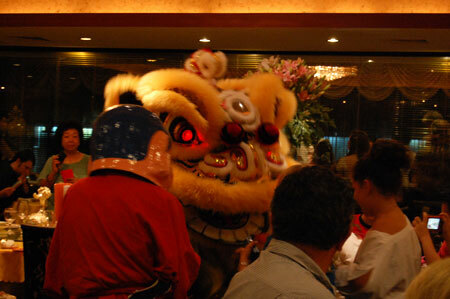 Two dragon started to look for ang pows (red envelop with money) and all the customers in the restaurants were feeding ang pow to those dancing dragon. Dragon must get the ang pows : a customer stood on a chair and held an ang pows in high position, and dragon also has to stand up and get the ang pows. It was a fun night. I didn’t eat much, but the service was great.